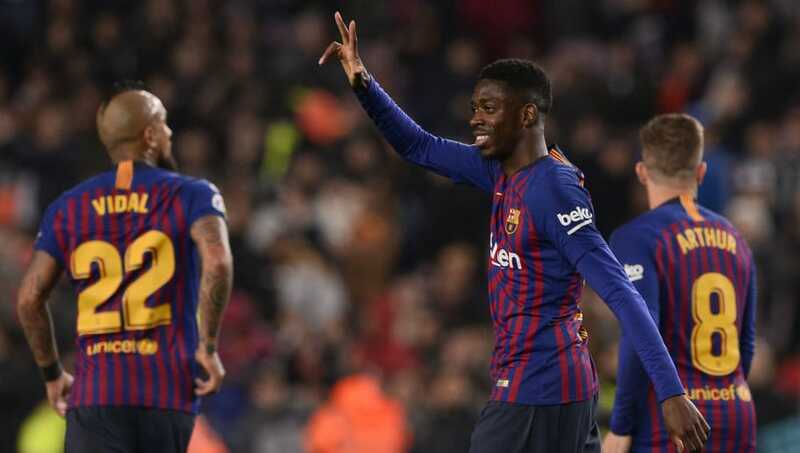 Ousmane Dembele and Lionel Messi starred as Barcelona overturned a first-leg deficit against Levante, as they reached the quarter finals of the Copa del Rey. After trailing 2-1 from the first tie, Barcelona, lead by ​Messi, started on the front foot and although not at their flee-flowing best, would eventually take the lead on the half hour mark in a devastating two-minute spell. The Argentine dispossessed the Levante back line, before sliding in ​Dembele, whose attempted shot cannoned fortuitously off Erick Cabaco to level the tie on aggregate. Moments later, the front pairing combined again, with the Frenchman showing calmness to round goalkeeper Raul Fernandez - before squeezing the ball in past the on-rushing defenders. After surviving Philippe Coutinho's disallowed effort, Levante were further punished on 54 minutes. Exchanging passes with Dembele, Messi slotted underneath Fernandez to put the tie beyond the reach of the beleaguered Granotas. The visitors best chance of the game fell to Emmanuel Boateng, who could only find the side netting from a tight angle, in an otherwise one-sided affair, as the Catalan giants progressed comfortably into the last eight. After their disappointing ​reverse a fortnight ago, Ernesto Valverde's much strengthened ​Barcelona side seemed determined to atone the arrears. His decision to start Messi and Dembele was repaid, as well as putting faith in Jeison Murillo - having featured in the first leg defeat. The performances of his players will have certainly given Valverde a selection headache ahead of a critical domestic and European period that sees them remain on course for the treble. Starting XI: Cillesson (6), Semedo (7), Murillo (8), Lenglet (7), Alba (7), Rakitic (7), Arthur, (7) Vidal (7), Dembele (8), Coutinho (6), Messi (9*). Substitutes: Suarez (6), Roberto (6), D.Suarez (N/A). Among many star performers, Messi's showman like display rescued the Blaugrana from a shock cup exit. Influential from the first minute, his dazzling feet and eye for goal caused the opposition huge problems throughout. His tenacity to capitalise on defensive naivety ultimately handed his team a route back into the game and was rewarded with a fine goal to seal the tie. Much has been made of Coutinho's underwhelming start at Barcelona and glimpses of brilliance were far and few between. Often over-elaborate, the Brazilian looked shorn of confidence and was guilty of several misplaced passes. His disallowed goal perhaps illustrated his (lack of) luck at this present time. Starting XI: Fernandez, Rober (5), Postigo (5), Cabaco (5), Coke (5), Campana (5), Prcic (5), Simon (5), Bardhi (6), Mayoral (5), Boateng (6). Substitutes: Dwamena (5), Jason (N/A), Doukoure (N/A). The quarter final draw takes places on Friday, before the La Liga leaders aim to extend their advantage to 10 points over closest challengers ​Atletico Madrid, when they host Leganes on Sunday. Meanwhile, the Granotas seek a return to winning ways as they host Real Valladolid the same evening.